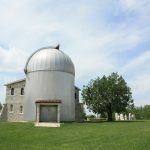 The attractive sports and recreational trail that offers magical and breathtaking views of Istria has a reconstructed section of the one-time railway line that connected Poreč and Trieste. The Istrian section of Parenzana is winding through wonderful valleys, over green hills, through vineyards and along olive groves all the way to medieval towns. 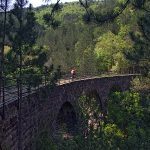 The entire trail is marked with characteristic yellow signposts providing information on historical viaducts, tunnels and railway stations that you will discover on this challenging journey. For those who would like to see and experience some magic of the locations where a railway composition once chugged, we have picked some locations that are accessible by car. Those places are located near the most interesting parts of the railway covered by shadow tunnels and impressive viaducts. 1. In the village of Valica, there is a house that was once the Savudrija-Salvore (Salvore) railway station, named after the fishing village located 6 kilometres away. If you set off towards the tourist resort of Kanegra you will arrive at a macadam road where the railway once travelled on and which offers a beautiful view over the Piran inlet and the saltfarms of Sečovlje. a. It is possible to walk to the inhabited station building as well as towards the village of Peroj along the route, arriving at the stone entrance to the tunnel below Roman Peak (Vrh Romana). On the left side, it is possible to climb the top and walk down to the route on the other side of the walled tunnel in which you can look into from this side, by going along the marked hiker’s trail. b. From the station you can also go towards Grožnjan-Grisignana and in the nearby long, right curve turn onto the little macadam road on the left side which will lead you to the closed entrance to the Kalcini Tunnel. This tunnel goes through the Parenzana’s greatest height above sea level (293 m). Today, mushrooms are cultivated here as well. 3. The village of St. Stefan near the village of Kostanjica. Here you can take a walk along the path beside the cemetery church (10-15 minutes) to the village of Biloslava, where the Kostanjica station was once located. Biloslava offers a beautiful view on the whole area. If you turn right towards Završje you can visit the 69 metre long Kostanjica Tunnel. 4. Immediately below the village of Završje is an old, crumbling building which stands in the place of the old station. It is possible to walk past it and visit two short tunnels and the large Završje Viaduct. 5. The village of Vižintini is located very close to the route. 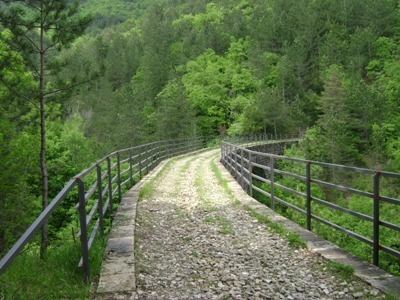 From there you can climb up the Parenzana: on the left side you will arrive at the Završje Viaduct, and on the right at the Antonci Viaduct. 6. The village of Antonci and the settlement of Krti: on the left side you arrive at the Antonci Viaduct. 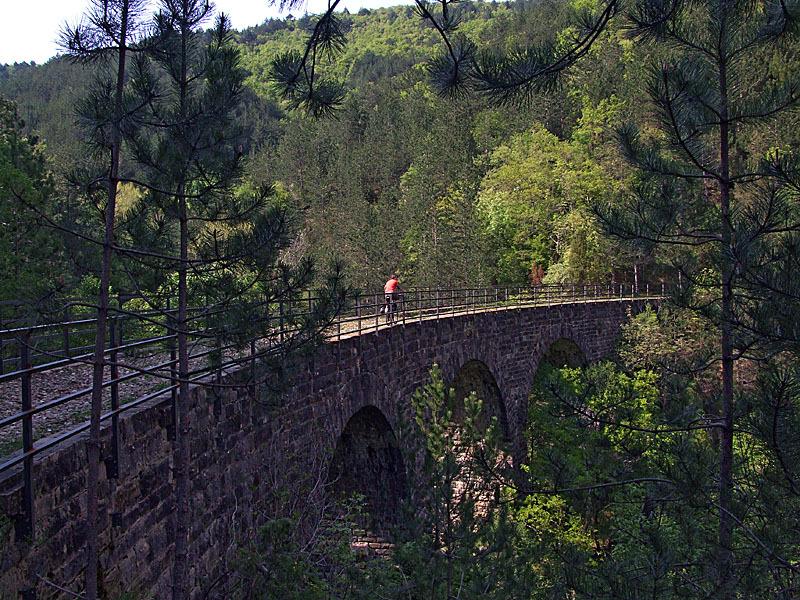 Continue on the right through the stunning landscape, at times passing through little coniferous forests and you will arrive at a fantastic combination of viaducts and the Freski Tunnel. 7. The village of Kanal beside Motovun-Montona. Beside the petrol station it is possible to arrive at the railway station. 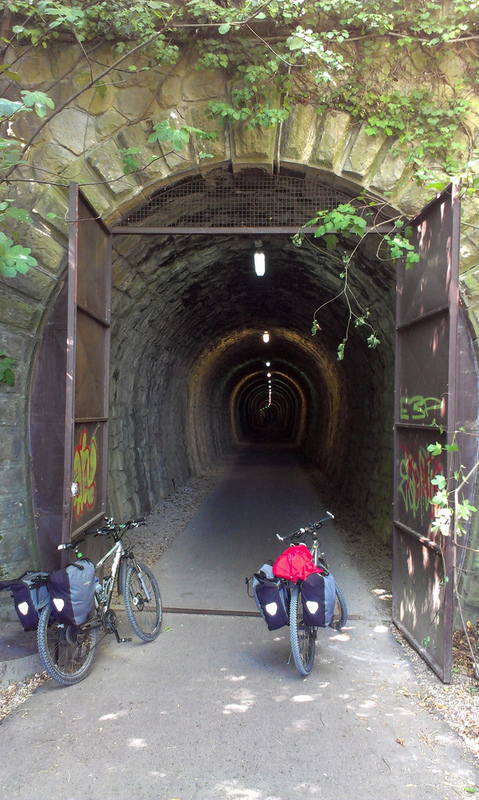 Not far from here, towards Vižinada-Visinada, is the Motovun-Montona Tunnel (flash light is recommended when passing through the tunnel). 8. 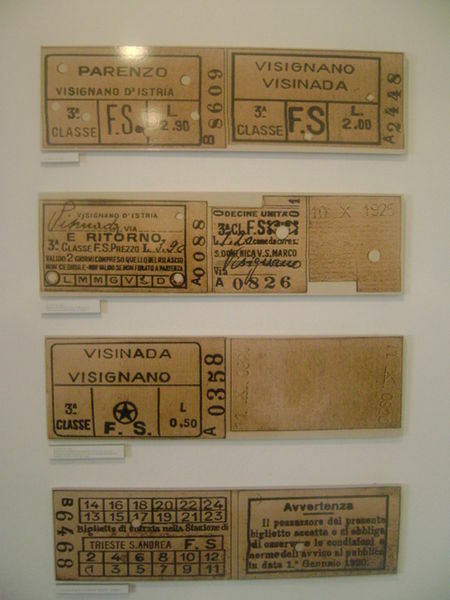 Immediately near the village of Karojba, from the direction of Motovun-Montona, by the macadam road it is possible to arrive at a widening in the road where the railway station once stood. Continuing on foot towards Vižinada-Visinada it is possible to arrive at the bridge over the Krvar creek in less than five minutes. 9. Viaduct Sv. Vital or Veli Most over the Sabadin stream is situated about half way from Vižinada-Visinada to Rakotule, and it can be reached from both sides. a. You can leave your car at the point where the road Rakotule – Špinovci crosses the route and go to the left in the direction of Vižinada-Visinada (about 2,5km). b. On the road from Vižinada-Visinada to Pula, about 200 meters after the junction to Poreč there is a widening on the left side of the road and there you need to take a route towards Motovun-Montona (about 2,5km).